Control Poa Annua and many other annual grasses and weeds. Poa Annua: Meet your Match! Finally, a strong and effective pre- and post-emergent solution for annual bluegrass (Poa Annua) is here. Poa Constrictor is an herbicide intended for use on ornamental turf such as golf courses, sod farms, cemeteries and residential or commercial lawns. Poa Constrictor can be used on established perennial ryegrass, Kentucky bluegrass, creeping bentgrass, turf-type tall fescue, St. Augustine and dormant bermudagrass for the control and suppression of many annual grasses and weeds. Poa Constrictor has both pre-emergent and early (two-leaf stage) post-emergent activity and works best in programs emphasizing both approaches. Controls: Poa Annua, Barnyardgrass, Crabgrass, Foxtail, Chickweed, Clover, Burclover, Purslane, Pigweed, and more. Poa Constrictor will also reduce competition from purple and yellow Nutsedge. At a general rate of 1 ounce per gallon/water, Poa Constrictor packs a very efficient punch. 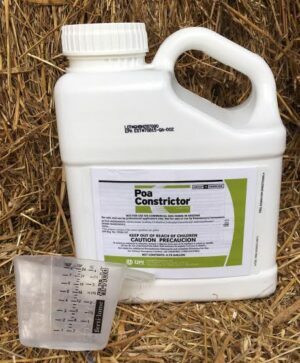 This .75 gallon container of concentrate mixes enough solution to apply to approximately 2 acres. See the Poa Constrictor Label for complete instructions.